A family snow day tradition is to bake bread. I barely eat bread anymore, but a snow day is a snow day. One of the things I always wanted to try was making baguettes. 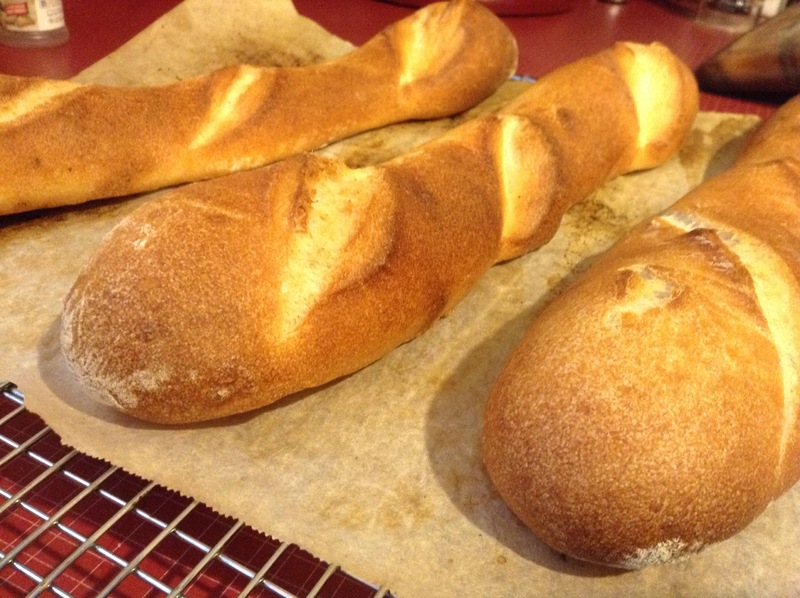 Well, I came across two baguette recipes this week and then got a snow day. Must be a sign! Add flour to large mixing bowl. If using active dry yeast, add to water and set aside for 10 minutes. If using instant, mix into flour. Add water, mixing with rubber spatula until the flour is combined and a chunky dough is formed. Cover with a damp dish towel and let rest for 20 minutes. Sprinkle salt over dough. Knead dough by hand for 10-12 min or use a KitchenAid with the dough hook on speed 2 for 8-10 minutes. Finish with several kneads by hand. Place in a tightly closing large plastic container and set aside for 45 minutes to ferment. From here on, I followed Farm Girl Fare’s recipe exactly. Took me just about four hours from measuring ingredients to bread on the counter. Perfect with soup or some European butter. I also sliced some thin and made mini open face sandwiches with bread, sharp cheese, chicken, and a drizzle of rosemary olive oil.